Oh, well didn't I get creative this week. 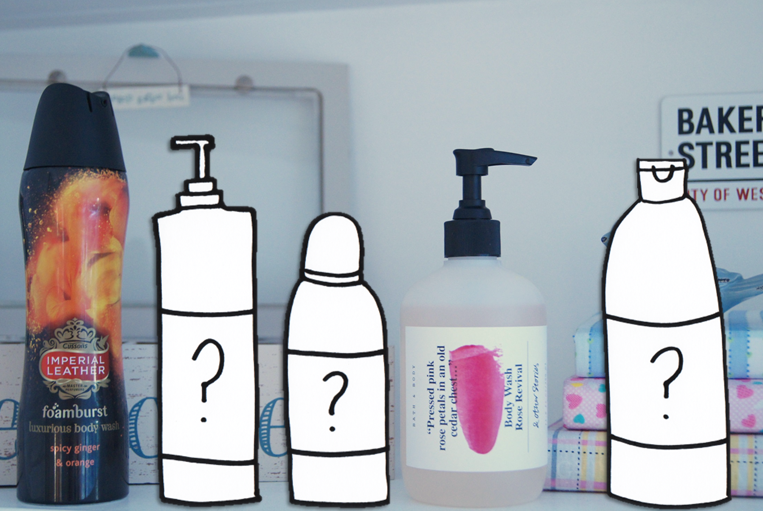 I decided to do my favourite shower gels for today's post but the problem is that I don't actually own some of my favourite ones at the moment (Christmas is coming), so I just added imaginary versions of them into the picture. Any of the 'mystery' products are labelled with a *. Now, don't lie, there is nothing more exciting than a foam body wash. This takes one tiny squirt and there is a huge expanding, delicious smelling beauty growing in the palm of your hand. I have to say that this is my current favourite scent from the range because they all smell really good and I particularly love how unusual some of the combinations are. This scent is great for the autumn/winter months. I have maybe said a word or two about this one on my blog before because I love it. It has to be my favourite Soap & Glory scent becuase it's not too sweet like some of them. I love the musky tones in this one and how rich it is. I don't have a bottle at the moment because I have been trying out others lately but I can't wait to get one of these bottles of glory back. Mmm.. Anything Rituals has me head over heals. The Yogi Flow scent is unique sweet almond oil - smells so good I could eat it. You've probably noticed my love for foam body washes now, they are just so exciting. This one comes in a lovely shaped bottle and you can also pick up miniatures every now and then. On a trip to London I popped into & Other Stories and it took me around 30 minutes+ to decided which body wash to get becuase they all smell so good! I decided to go for my traditional favourite of rose scented because there's nothing I love more. This rose scent is quite a grassy floral which I find really refreshing in a shower. Rose is back! I know, I know, what a surprise? This is acceptable though because this time round it's a warming, relaxing rose with less of a zingy, grass undertone. I could maybe go as far to say that this is my all time favourite because it contains my favourite scents and smells just like beloved Rose a Water. This one is rather expensive £17.50 but my heart longs for it to grace my shower shelves again. Which shower gels do you love? Ooo I love Soap & Glorys Clean on Me too. Hopefully the huge Boots gift set will be half price again this Christmas so I can stock up this year. I'm using Snow Fairy from Lush right now - it's amazing! Lovely blog! Oh I love Imperial Leather Foamburst! I have the Jasmine one at the minute and it's brill. I also really love Soap and Glory Clean On Me and Victoria's Secret Pure Seduction - they both smell AMAZING! Your blog is so lovely, you have a new follower! I love the creativity on the post's photo! Unfortunately I don't think I can find any of those products where I live.. I like the idea of the mystery products, haha. I'd love to try some S&G shower gels!